Bottoms Up definitely deserved its fate. It's an unfunny mess. 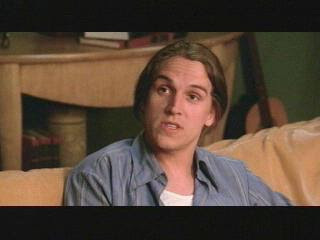 Jason Mewes plays Owen, who is a bartender. His Dad's bar is about to close because of money problems. Then out of the blue, Owen sees there's a "King of The Bar" contest in California. He applies, but doesn't win, and now he needs to get the money fast. He meets Lisa Mancini (Hilton) and blackmails her to be popular. It's a very stupid plot, with the choppiest editing I've seen in awhile. There's no buildup, or segue into scenes. There are plot holes and there is dialogue missing. And the "Golden Palace.Com" plug was the most shameless plug ever. "Hey man, I have an idea, let's win some money at Golden Palace.Com!" says one character. Also, why does Paris have blonde hair on the cover, but she's a brunette in the film? Jason Mewes was trying his hardest to breathe life into his character, but the script let him down. Paris Hilton was also trying... but not too hard though. She's basically playing herself. It's funny when other characters call her "A whore". Truth in jest perhaps? Let's not mince words: Bottoms Up is terrible.